"2019 S.V.A. Newz and Events"
SVA's color theme for April is yellow for Easter! 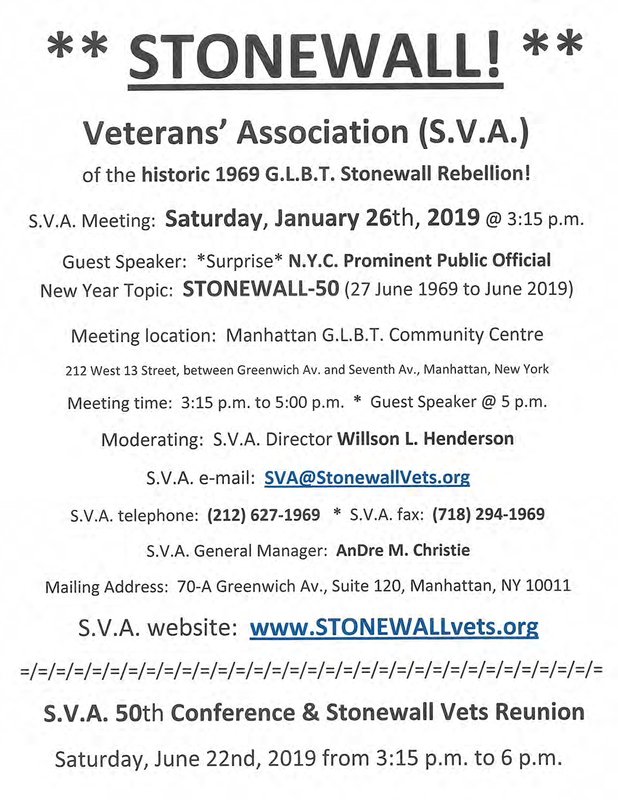 Saturday, June 22, 2019 -- "SVA's 50th ANNUAL CONFERENCE & STONEWALL REUNION + TESTIMONIALS"
The National STONEWALL Rebellion Veterans Association ("S.V.A.") sponsors, produces and presents the milestone, informative, unique, interesting, rare and fascinating "SVA's 50th Annual Conference and Symposium & Stonewall Veterans Reunion + Testimonials"..... Many surviving veterans of the New York City police raids on the Gay STONEWALL Bar & Club and the five-night 1969 Stonewall Uprising attend from across America from California to Maine and Washington to Florida..... Special 50th Anniversary Tribute to Gay icon: 'Saint' Judy Garland (1922-1969), international entertainer, actress and singer..... New York City Public Officials including congressmembers, state senators and assemblymembers and NYC councilmembers are scheduled guest speakers..... SVA's divine venue for "STONEWALL-50" is the landmark St. John's Evangelical Lutheran Church ("SJELC") on Gay-legendary Christopher Street just off Seventh Avenue South in historic Greenwich Village, Manhattan, N.Y. The SJELC's pastor Rev. Mark E. Erson delivers the yearly "S.V.A. Invocation"..... Film sequences from the powerful, exciting and timely movie "STONEWALL!" by the acclaimed, openly-Gay movie director Roland Emmerich will be shown. The SVA's director Willson Henderson was the exclusive 'Stonewall' consultant on the film.... SVA's 'live' entertainment tradition continues with Stonewall Era singer Sandy Rapp..... Music from the SVA's awesome compact disc (C/D) collection: "Songs of the Original STONEWALL Club Jukebox" (1966-1969)"..... SVA's conference, reunion and music ignites the celebratory "Ten Days of Gay Pride" on Saturday, June 22nd @ 3:15 p.m. and it shindigs until 6 p.m. or so! This Memorial Day Weekend, as the National STONEWALL Rebellion Veterans Association plans ahead for the half-century celebration of the 1969 Stonewall Rebellion and the half-century anniversary of the S.V.A., we also remember all of the Stonewall veterans who the G.L.B.T. community has lost! Most were victims of the deadly AIDS War during all of the 1980s and the 1990s! The tremendous loss changed the face of the G.L.B.T. community today! Comfort foods are provided. Meeting and commemoration begin @ 3:15 p.m. The STONEWALL Veterans' Association holds its "S.V.A. 16th Annual NYC Streetfair"! Come meet and greet some legendary veterans of the historic Stonewall Rebellion! After all, on the eve of the 50th anniversary of the uprising and, naturally, the S.V.A., many in Manhattan are full of so much... Pride! Another unique feature of only this streetfair is that on display for the public's information and interest will be the famous, blue 1969 convertible "Stonewall Car". One of the unique items for sale at the S.V.A. streetfair is the "Songs of The Stonewall Jukebox" compact discs. The SVA's streetfair venue is on University Place between Union Square/East 14th Street and Waverly Place in Manhattan, NYC. Open 10 a.m. to 6 p.m.
SVA's new month flyer shall go here at [*] and then remove the *! The STONEWALL Rebellion Veterans Association members and supporters mark the countdown of exactly two months until the 50th anniversary of the Stonewall Uprising on the night of Friday, June 27th, 1969! This S.V.A. gathering is focused on further strategizing and planning for "STONEWALL-50"! Documentarians will be present. Get2gether is hosted by Willson Henderson. Reports from S.V.A. Executive Committee members (all Stonewall veterans) such as Bert Coffman, Joni Sobel, Ramon Bellido, Rusty Rose, Bill Salzman, Nance Lomax and David Leong. Meeting at the Manhattan GLBT Centre starts promptly @ 3:15 p.m.
Sunday, April 21 -- BROADWAY CARES PRESENTS "33rd ANNUAL EASTER BONNET COMPETITION"
Broadway Cares/Equity Fights AIDS ("BC/EFA") is known for decades for producing some of the most professional, talented and fascinating shows on- or off-Broadway! This is the incredible thirty-third incarnation of the awesome "Easter Bonnet Competition" -- a fund-raiser for BC/EFA. Tom A. Viola is the incredible hands-on/feet-on executive producer! Once again, the production is held at the legendary Minskoff Theatre at 200 West 45th Street at the famed Shubert Alley in the Times Square area of Manhattan, NY. Showtime is @ 8 p.m. For more 411: www.BroadwayCares.org. Besides being a charter member and boardmember of the STONEWALL Veterans' Association and a longtime official of the Imperial QUEENS & Kings of Greater New York, Raymond James McCaffrey was also a military veteran of the Korean War! For more info on "Ray-Jay", visit his webfile at the S.V.A. : www.StonewallVets.org/RayMcCaffrey.htm. 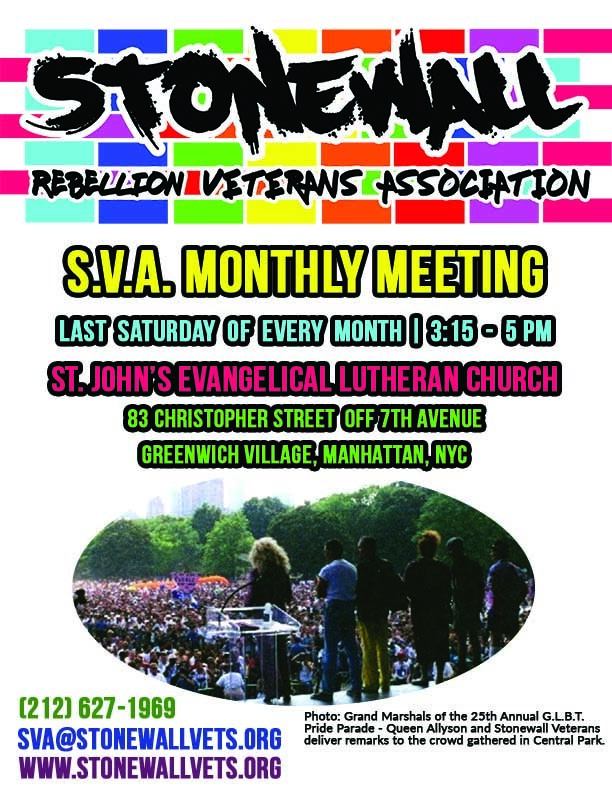 Saturday, March 30 -- MONTHLY MEETING of the STONEWALL VETERANS @ 3:15 p.m. This is the three-month marker before "STONEWALL-50" with the SVA's conference, the G.L.B.T. festivities involving S.V.A. and the two simultaneous Gay Pride parades/marches in New York City!! Discussing and planning for those happenings is the main topic for today's meeting. Some national media "S/W-50" project planners have confirmed. Commandeering the meeting is the SVA's director Willson Henderson. Communications with public officials are reported by Bert Coffman. Updates on the Reclaim New York City G.L.B.T. Pride March are delivered by S.V.A. boardmember Ramon Bellido, who bi-weekly attends their weekly meetings. Leigh McManus tells one-way conveyances with the main NYC Pubic Library in Manhattan regarding their overtly exclusionary and grossly lacking 'Stonewall' history display. Rusty Rose updates outreach with other G.L.B.T. organizations including the diss-respectful 'Heritage of Shame'! Joani C. Sobel reports on the SVA's next streetfair and the SVA-won battle with Community Bored #2. Stonewall vet David Scott fills us in on the SVA's "S/W-50" committee news. Members and guests are greeted at the door by the SVA's general manager AnDre M. Christie. S.V.A. dues and sponsorships are payable by check or money order. Meeting at the Manhattan LGBT Centre begins sharply @ 3:15 p.m. In their new television news series "Only In New York", local tv station PIX-11 presents a documentary on former NYCPD police officer and NYC Councilman James E. (Jed) Davis. Interviewing Jed's dedicated mother Thelma Davis and his virtually lifelong little brother Geoffrey A. Davis are crucial. Interviewing Brooklyn Borough President Eric L. Adams, also a former NYCPD police officer and Jed friend, makes total sense. Getting comments from Al 'Sharp-tongue' is a disconnect. Jed referred to him as "a former hairdresser"! 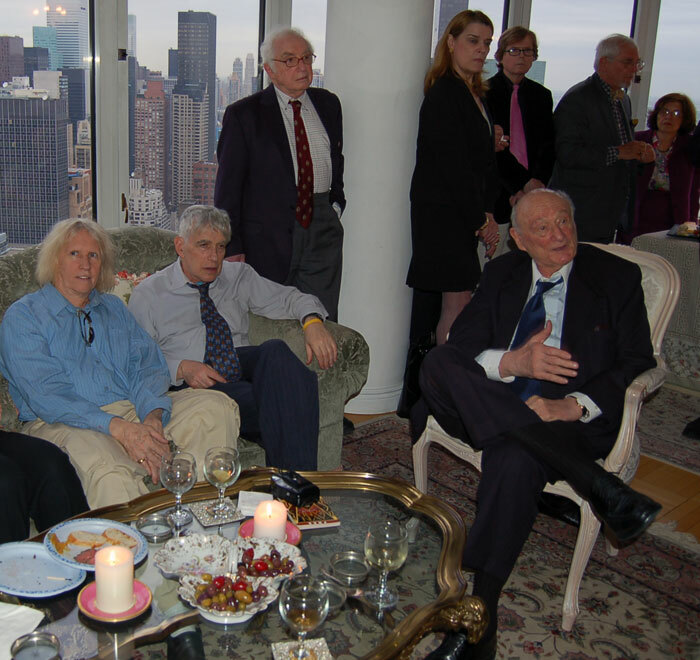 Jed was a known active and ardent supporter of the STONEWALL Veterans Association. In fact, he was an honorary member. Since PIX-11's junior creative producer Heath Benfield failed to contact several key people, we are presuming that the Jed documentary will not be a 'complete' retrospective of Jed's real life. The project shows signs of straight-washing! We doubt, in advance, they know his non-family nickname was "Jed". Nonetheless, the S.V.A. is glad that Jed is getting attention he deserves. The half-hour show airs on Channel 11 locally in the NY Tri-State area on Friday evening, March 29th @ 10:30 p.m. (EST). This G.L.B.T. town hall is sponsored by the Reclaim GLBT Pride Coalition ("RPC"). The well-planned G.L.B.T. community forum is to openly discuss and plan the "Spirit of Stonewall March - STONEWALL-50" aka "the alternate GLBT march"! Thus, this get2gether welcomes community input. The actual milestone marches, three months away, happen on the last Sunday in June on the 30th. This march blasts-off appropriately in Greenwich Village, NYC, in the the Stonewall National Monument area at Seventh Avenue and Christopher Street at high noon! The march proceeds up a major avenue and into Central Park on The Great Lawn for the largest G.L.B.T. rally in history! Tonight's event is co-hosted by Ann Northrop and Colin P. Ashley. Forum is held at the charming Church In The Village at the corner of Seventh Avenue and West 13th Street. Ignite time is @ 6:30 p.m. until 8:30 p.m. For more 411, visit: www.ReclaimPrideNYC.com. To commemorate Miss Diana Ross's birthday, among many other tributes, there are commemorations on "Entertainment Tonight", "Extra", "Inside Edition" and even "Nightline"! A documentray on "Diana Ross" will be released in nearly 1,000 movie theatres across America. It includes the remastered "Diana Ross Central Park Concert". Wednesday, March 20 -- S.V.A. DINNER MEETING with REPS of the NYS GOVERNOR ANDREW CUOMO @ 5:30 p.m. Contrary to misinformation, the New York City St. Patrick's Parade has always had Gay people in it as participants and, of course, at it as spectators! Currently, the G.L.B.T. Lavender & Green Alliance is the official Gay Irish group in the St. Pat's Parade. Special luminary marchers include NYS Governor Andrew Cuomo. The parade line-up is on Fifth Avenue at 42nd Street in Midtown Manhattan. Parade proceeds up Fifth Avenue to East 80th Street. Note: Although St. Pat's Day is on the 17th, the parade is 'never on a Sunday'! Parade launches @ 11 a.m.
Wednesday, March 13 -- S.V.A. DINNER MEETING with "S/W-50" PROJECT PRODUCERS @ 5 p.m.
Wednesday, March 13 -- SVA's SENIOR LEGAL COUNSEL HALLY WEINER's 84th BIRTHDAY! Monday, March 11 -- BROADWAY CARES PRESENTS GENDER-BENDER MUSICAL "BROADWAY BACKWARDS"
Broadway Cares/Equity Fights AIDS produces this exciting and highly-talented "Broadway Backwards" musical and theatrical event every year. Executive (and hands-on) producer is Tom A. Viola. Venue is the New Amsterdam Theatre at 214 West 42nd Street in Times Square in Manhattan. Showtime @ 8 p.m. For more 411, please visit: www.BroadwayCares.org. The "Queen of Soul" Aretha Franklin, who passed a half-year ago, was also the soul queen at the original Stonewall Club in NYC! Watching this super special will acquaint you with many songs by Aretha in the 1967 to 1969 Stonewall Jukebox. They include: "I Ain't Never Loved A Man The Way I Love U", "Respect", "Dr. Feelgood", "Baby I Love U", "A Natural Woman", "Chain Of Fools", "Since You've Been Gone", "Think", "The House That Jack Built", "See-Saw" and "Share Your Love With Me"! Performers featured singing Aretha songs are Patti LaBelle, Celine Dion, Jennifer Hudson, Alicia Keyes, Kelly Clarkson, Smokey Robinson, Belinda Carlisle, John Legend and many other singers. Showtime on CBS-TV is @ 9 p.m. until 11 p.m. Among the confirmed guest speakers are Queens Borough President and Queens Borough District Attorney candidate Melinda R. Katz and former NYC Councilwoman and current Queens Borough President candidate Elizabeth Crowley. The party venue is The Globe Tavern, a popular Irish drinkery and eatery, at 4910 Skillman Acenue in Sunnyside, Queens. Blast-off is @ 7 p.m.
Co-chairing the S.V.A Social Committee's dinner meeting are the SVA's director Willson Henderson, S.V.A. vice-president Bert Coffman and SVA's general manager AnDre M. Christie, pulling up next to the eatery in his big BMW sedan. This open-ended get2gether, with an expansive agenda, will be approximately three hours complete with Lambrusco and a four-course dinner! Glasses clang @ 4:30 p.m.
Unquestionably, the gayest show on television virtually every year is the Academy Awards or, as Bette Davis named it, The Oscars -- Hollywood's biggest night! It is the gayest show because of all the Gay talent, grand attire and over-the-top fanfare! Gay favorite Barbra Streisand presents the 'Best Picture' award. Glenn Close, on her seventh nomination for same, should win her well-deserved 'Best Actress' award for "The Wife" and her outstanding four-decade career! Bette Midler sings "The Place That Lost Things Go" from the movie "Mary Poppins Returns". Glamorous Jennifer Lopez appears with her dapper husband Alex Rodriguez! "Dreamgirls" winner Jennifer Hudson belts out "I'll Fight" from the film "RBG (Ruth Bader Ginsberg)". La Gaga performs "Shallow" from (the fourth remake of) "A Star Is Born"! Showtime is @ 8 p.m. on ABC-TV until 11 p.m. or so! Attendees can expect an informative and exciting meeting at the S.V.A. There is a diverse assemblage planned with Brooklyn Borough President Eric Lee Adams, several Stonewall veterans confirmed including Berti Coffman, Leigh McManus, Ramon Bellido and Joni Sobel, representatives from Reclaim LGBTQ Pride March, two producers from a national television network, a professor of Gay studies at Columbia University, and a few public advocate candidates confirmed including Jared Rich, Esq. activist Tony Herbert and Dr. David Eisenbach! The SVA's general manager AnDre Christie provides a unique retrospective of the S.V.A. since he became a young staffer in 2003 including WLH being declared the 'Gay Rosa Parks' by the Civil Court of N.Y.C. and the pivotol Stonewall vets who the G.L.B.T. community lost over that period such as Storme DeLarverie, Emile Griffith, John-Paul Ranieri, Electra O'Mara, Charles Snyder and Dave West. The S.V.A. meeting starts promptly @ 3:15 p.m. captained by Willson Henderson. SVA's February 2019 Monthly Meeting with a Surprise Brooklyn Male Public Official Guest! There will also be a handful of 'select' (it means not all) N.Y.C. Public Advocate candidates. Wednesday, February 20 -- S.V.A. BUSINESS SPONSOR PARTY in SOHO, MANHATTAN @ 6 p.m. This important forum, exactly one week before the special election of a new N.Y.C. Public Advocate, is sponsored by the Manhattan Black Bar Association ("MBBA"). Confirmed candidates include Jared M. Rich, Esq., Dawn Smalls, Esq. and Michael A. Blake. Currently, the public advocate position is vacant. The impressive venue is in the state-of-the-art auditorium of the Fordham Law School at 150 West 62nd Street opposite Lincoln Center in Manhattan, NY. Program commences @ 6:30 p.m. followed by a catered reception! Monday, February 18 -- SUPPER MEETING with a NEW YORK CITY PUBLIC OFFICIAL @ 5 p.m.
Tuesday, February 5 -- PUBLIC ADVOCATE DEBATE at MEDGAR EVERS COLLEGE @ 6 p.m.
next monthly meeting is on 'the last Saturday of the month', January 26th, 2019 @ 3:15 until 5 p.m.
Public Advocate (P/A). Candidates must schedule a specific time with S.V.A. P/A election is Tuesday, February 23th! Post-Event Update: The special public official guest speaker was New York State Senator Dyane J. Savino! Wednesday, January 16 -- NYC PUBLIC ADVOCATE CANDIDATES' FORUM at GLBT CENTRE @7 p.m.